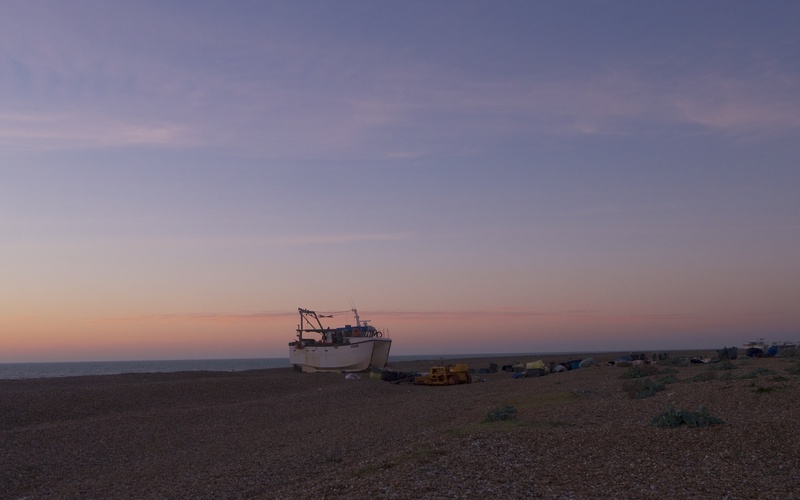 The dawn sky is a wash of saturated purple and vivid orange like an overdone postcard; the sunlight edges the curved hulls of the fishing boats, warms the waves of shingle to a russet and whitens the windows in the small wooden houses. 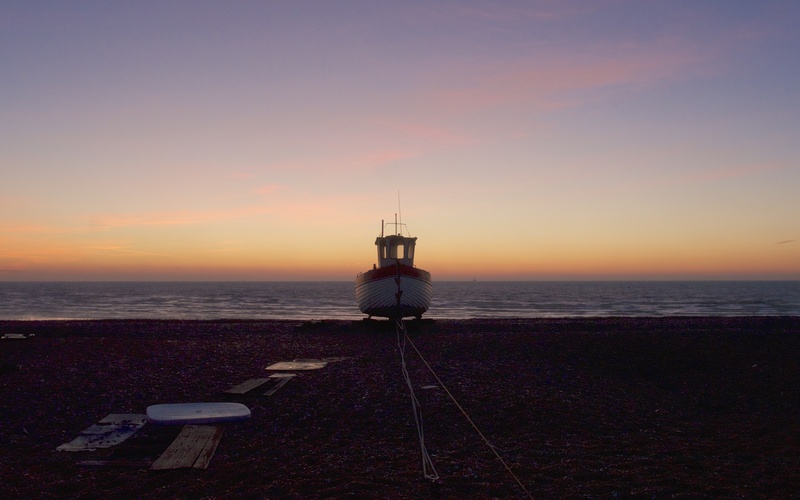 Boats, winches, sheds, containers, all manner of boxes; coils of rope, lines of rail and planks of all shapes and sizes; discarded nets and pieces of wood, plastic, steel and rusting iron; all sit or lie dead still on the impenetrable round-washed gravel. The working parts of a hazardous life and, for those that hazard just a glance, installation art at the edge of the sea. 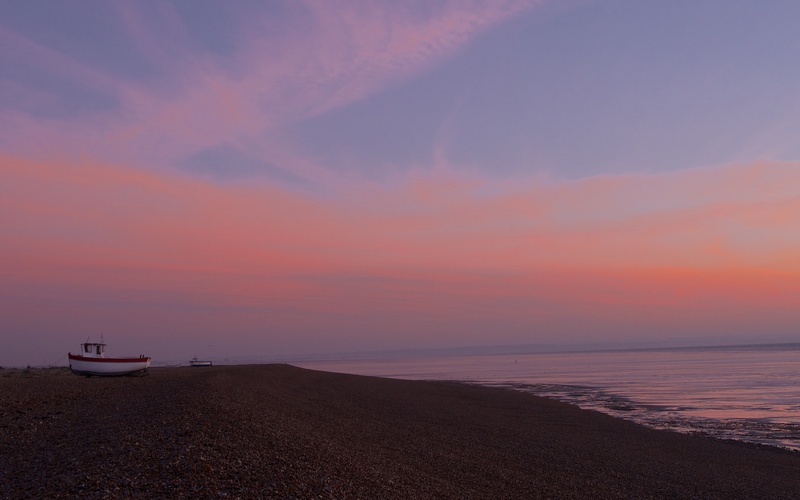 The tide is out and the sun, when it rises, runs and races across the flat film of watery beach below the solid, shingle banks. The low sun is slow to warm, the wind cuts and the gulls idle from their roosts in long, lazy lines. The long, shingle shoreline and wide beach below. A modern style of fishing boat, a twin-hulled tub, and the trail of equipment set out to keep it serviceable. The dawn light rapidly strengthens. The old lighthouse in the early morning. After dawn has come and gone and the uneventful light of everyday takes hold, there are still a few plants in flower. 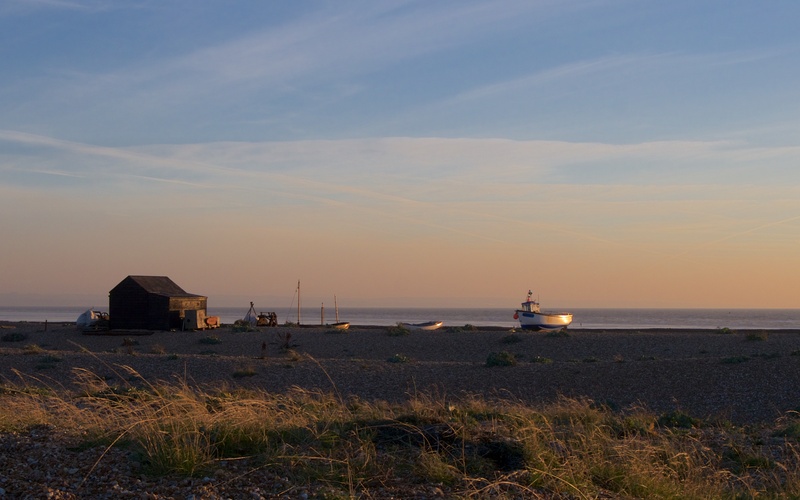 Dungeness supports a rich and bewildering flora, and the lichens and the mosses are also numerous and even more of a challenge to identify. The exceptional shingle habitats, the rare lower plants, flowering plants and invertebrates, perhaps most notably the bumblebees, and the migratory and wintering birds are the principal reasons for the array of conservation designations on what is, technically, a cuspate foreland formed over the past 5,000 years. 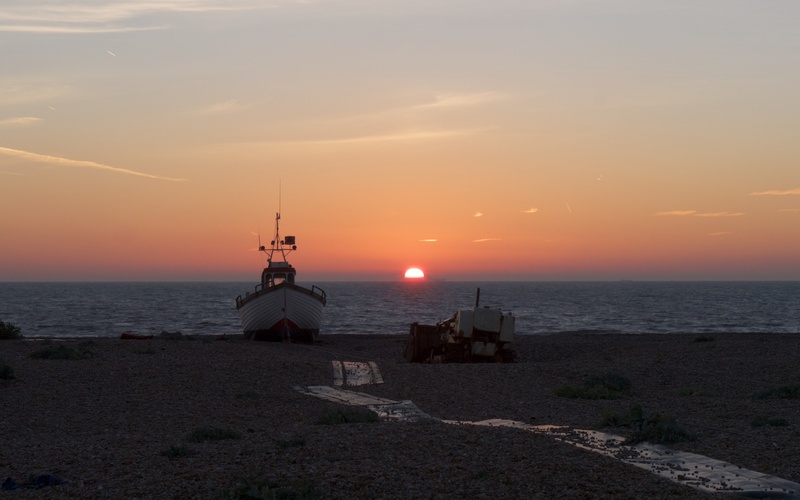 The Site of Special Scientific Interest (SSSI) citation prepared by Natural England for Dungeness, Romney Marsh and Rye Bay is a brilliant, short essay on the formation and range of the shingle and wetland habitats and the notable species to be found. 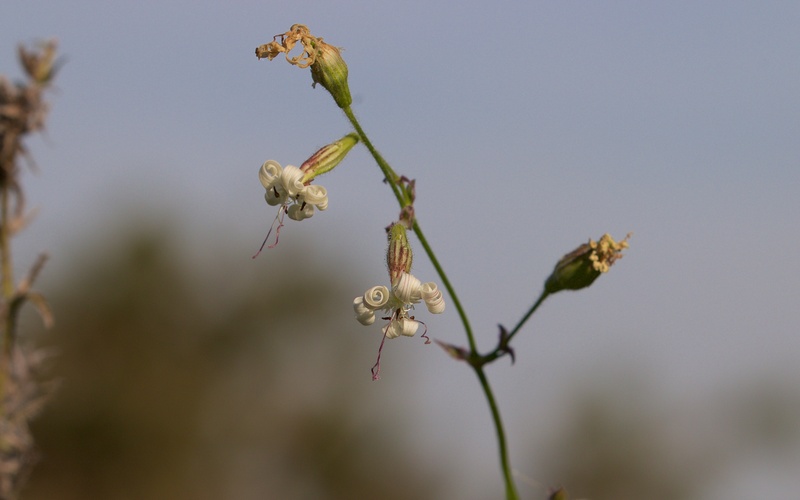 This is old and nearly departed Nottingham catch-fly (Silene nutans) but the petals remain elegantly twirled to the last; this is a rare plant of limestone and shingle, common across much of Dungeness. 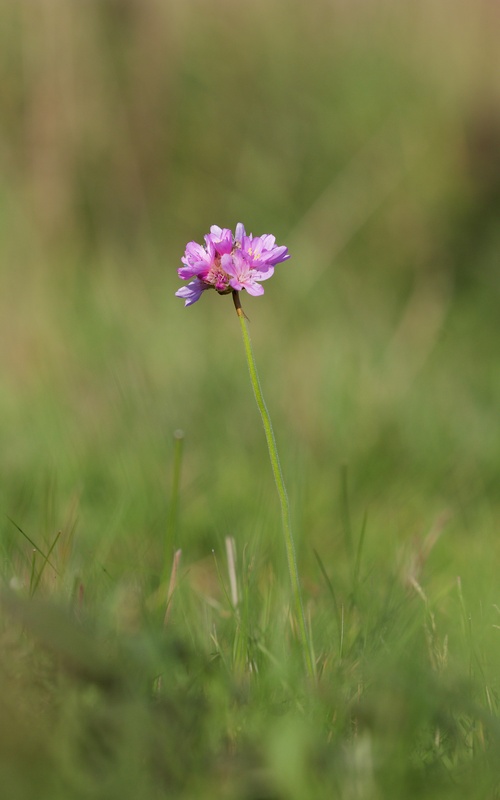 One or two spikes of sea thrift (Armeria maritima) flower in the turf. 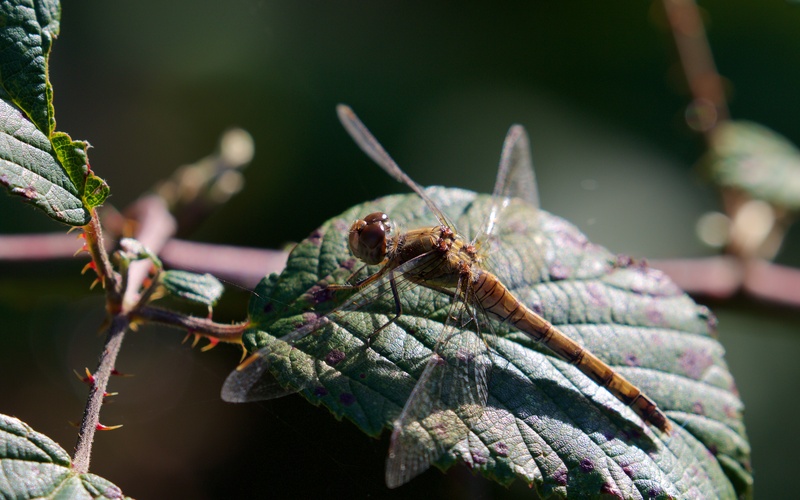 Common darters (Sympetrum striolatum) were everyhere but always sheltering in the lee of tall vegetation. 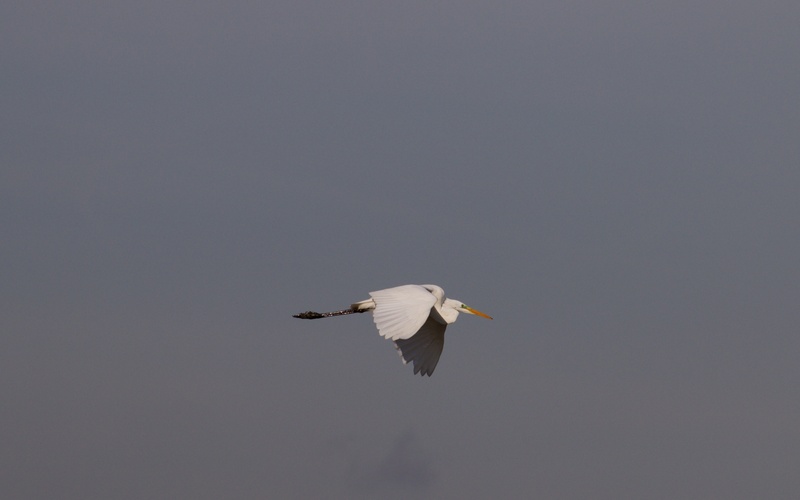 Great white egret, little egret, grey heron, cormorant, wigeon, teal, gadwall and mallard were all present on the flooded pits within the RSPB Reserve where a circular walk leads between the hides and takes in the shingle habitats with a wide view of grazing marshes, endless pylons and the huge church tower at Lydd. Feral greylag geese flight between the waterbodies with more raucous noise than a crowd of supporters from the winning side. Flocks of linnet and goldfinch bound away off the weedy shingle and stonechats keep watch from the tops of bushes. 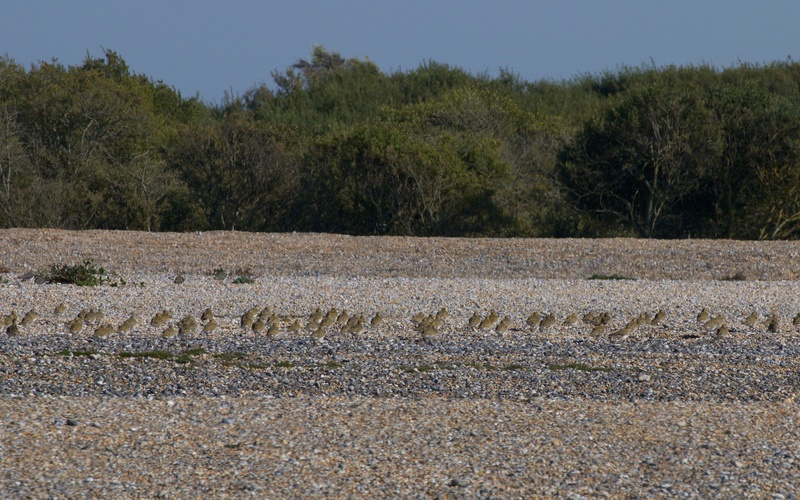 A flock of golden plover on the shingle within the RSPB reserve. Flocks of golden plovers, lapwings, starlings and large gulls on the shingle are often put to flight by passing marsh harriers. A peregrine flies fast and low across one of the pits by the road before turning into the wind and hanging; the tufted ducks wisely refuse to fly from the water. Warmed seawater, that has been pumped in and cooled the steam in the turbines of the one operational reactor (B), is piped back to sea (with the local sewage) and bubbles up just offshore. The ‘patch’ or ‘boil’ is a bubbling, brown broth that builds a local food supply, which attracts the fishermen with their rods that cast a mile and a constant flock of seabirds; the birds bring the birdwatchers with telescopes on sturdy tripods to pick out rare gulls, skuas and terns from amongst the usual suspects: herring, black-headed, common and lesser black-backed gulls. 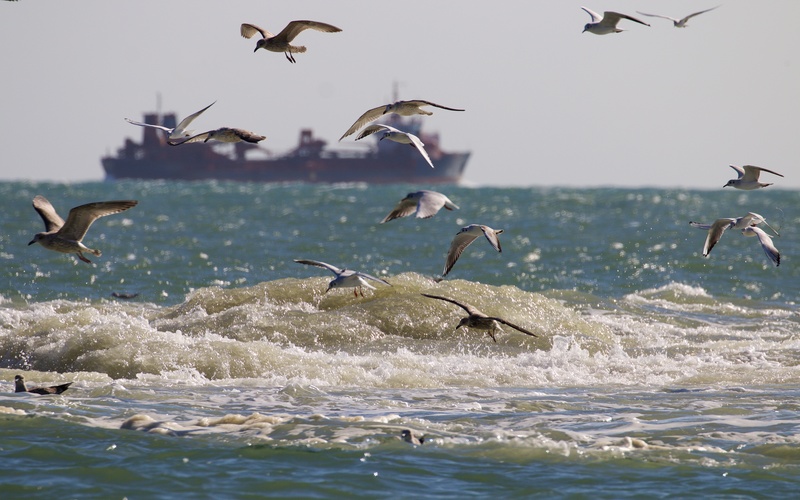 The gulls pick the rancid pickings from the surface, terns dive for fish and skuas chase the terns. 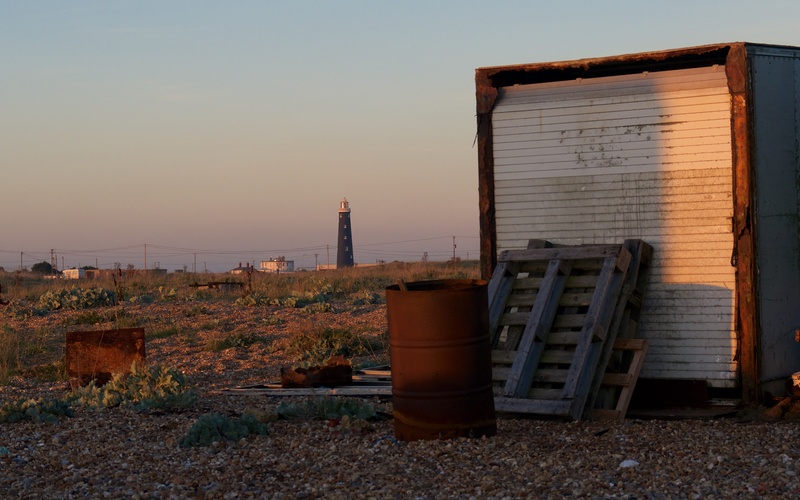 The ‘patch’ at Dungeness; here there is sometimes the rare amongst the throng of common species. Came across the site purely by chance. Good to see you are still active in the conservation world. We have both come on a long way since our time with the NCC in Bangor and our shared old Corsa.